Be the first to share your favorite memory, photo or story of Eulalia. This memorial page is dedicated for family, friends and future generations to celebrate the life of their loved one. 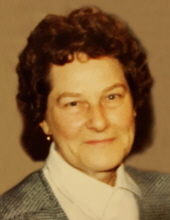 Eulalia Marguerite Hess, 94, of Green Forest, Arkansas, formerly of Waterloo, IA, died Saturday, April 6 at her home while under the care of family and Hospice of the Hills. She was born November 2, 1924 in Waterloo, the daughter of Luther and Mary Trainor Hise. She married Merle Hess on July 1, 1967 in Walnut Ridge, Arkansas, and they resided in Waterloo. He died November 13, 2015. Eulalia was formerly employed with St. Francis Hospital as a bookkeeper, then as a homemaker. She is survived by many nieces and nephews, and a host of cousins and friends. She is preceded in death by her husband, Merle Hess, two brothers: James and Henry Hise, and three sisters: Edith Shaffer, Julia Hise, and Teresa Teel. Mass of Christian Burial will be 9:00 a.m. Saturday, April 13 at Queen of Peace Catholic Church with burial in Mt. Olivet Cemetery, both in Waterloo. Public visitation will be 5-7 p.m. Friday at Hagarty-Waychoff-Grarup Funeral Service on South Street with rosary at 6:45. To send flowers or a remembrance gift to the family of Eulalia Marguerite Hess, please visit our Tribute Store. "Email Address" would like to share the life celebration of Eulalia Marguerite Hess. Click on the "link" to go to share a favorite memory or leave a condolence message for the family.